I’m done tying… for now. 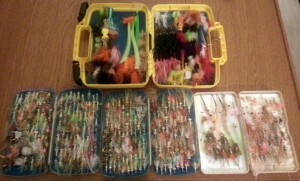 I’ll need to tie more for Florida, but for this trip, I really can’t put much more in the boxes. I even added a generic box to my Cliff Box line up so I’d have a place to go. I’m guessing it is about 600 flies. 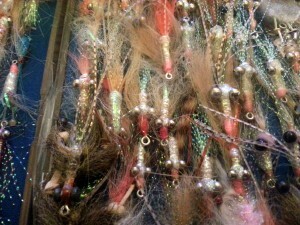 I tied about 90% of these (I have a couple poppers, two crab flies and two different tarpon patterns I didn’t tie). Even some crabs in there. 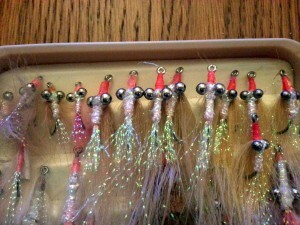 Looking forward to putting some of these in the water. This entry was posted on Thursday, March 28th, 2013 at 2:12 am	and is filed under Flies. You can follow any comments to this entry through the RSS 2.0 feed. You can leave a comment, or trackback from your own site. You have a sickness, and its fishing… go get em!!! Nice looking boxes Bjorn! I took about the same amount to Abaco. I tried to keep track of how many flies I actually tried out which was interesting. I tried a fair number of flies, maybe 6 to 8 each day, even when a fly was working just to see what the fishes reactions were to different patterns. Given all the variables it was not very scientific but it made me feel better about bringing so many flies with me. Just returned from 5 days on Andros, had 4 boxes with me. Best results were from the tan Simram, Turneffe Crab, and Gotcha. The day after a long dinner conversation about the classic flies with someone whom I truly respect for his experience, philosophy and flytying, I fished for 90 minutes with a Pink Puff, Bonefish Special, and a Bonefish Bitters, in the most appropriate colors available. 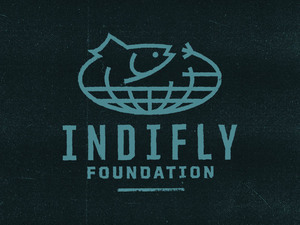 Zero: in fact, those flies repelled fish. Perhaps they worked 50 years ago. 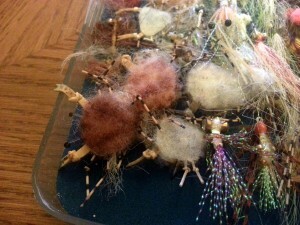 Have a great trip, and keep switching flies. You need like 20 Gotchas. Maybe 2 sizes and 3 weights. Giant Gotcha Clousers work too. I’d have a few crabs, but that’s just on principle… think I’ve only actually used a crab once in the Bahamas, and it worked, but only when I let it sit. Strip and the bones were gooooone. Course, that could have been for any reason–tide, weather, it was Tuesday or maybe I forgot to pour one out for my homies. Bonefish are schizo. No wait! I lie. There was a little flat in Eleuthera that was totally pockmarked with all these little sand mounds. In each little divot was a crab. Bones on that flat would follow a Gotcha, and maybe 1 in 10 would eat, but show ’em a crab and BAM, fish on. Course, you had to fish it like a crab: strip, stop, wait… looong strip: FISH ON! It was pretty amazing the difference between the usual shrimp patterns and the crab. Day and night. Oh, and I have caught bones on Puffs and Bitters, but only banana bones. I have plenty of sizes… from 8 to 1/0. 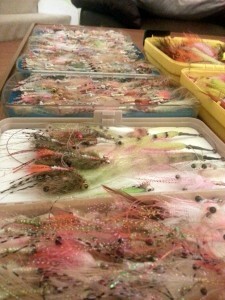 I don’t tend to have the same size fly in different weights though… probably a weakness in my game.